Barcelona have dominated Europe so much lately that I bet even most Americans could find Barcelona on a map. Okay, let’s not get carried away here, I mean how many Americans have even seen a map? Still, the 1st match in the Champions League Group Stage on Tuesday is going to be a big one. "Oh, look! Ibra's coming over for a playdate!" But can Milan beat Barcelona? Anything is possible in football. 90 minutes is a long time to defend such a reputation against another champion team. And if anyone is going to take points from Barca in Group H, it’s going to be Milan. So I am sure Guardiola is preparing for a battle. On the other hand, Allegri has to believe in miracles, and I’m sure he has been instilling confidence in our boys and making plans in tactical wizardry. Barcelona play tiki-taka football, which is based largely on possession and short, quick passes that work the ball up the field. This style of play requires all players to be very skilled with ball-handling, and it shows - when Barca are on the field, they basically have a keeper and 10 playmakers. And a whole lotta love. The best part about scoring? The hugs. Milan potentially have the antidotes for this, though. While Barca are busy hugging each other, we’ve got Ibra attacking teammates verbally and physically. Or Gattuso tackling our own center back. How is that supposed to help you ask? You’ve heard of the saying “What doesn’t kill you will make you stronger,” right? Well size and strength are one advantage that Milan have over Barca. If the little Spanish pixies want possession, they may just get out-muscled for it. Speaking of possession, that will be interesting. Both teams typically average over 60% possession. Which means that unless they alter the laws of mathematics, something will have to give. Either one side will still dominate, or it will be a bit of a stalemate, and no one wants the latter. So Milan will likely rely on their muscle and their individual talents, while Barca will use their speed and collective talents to control the ball. Stamina will be a big factor, too. One of the components of tiki-taka football is wearing down the opposition with the constant ball movement, making them run non-stop. Barca likely have an advantage here, having played more league games, but the determination I saw on Friday leads me to believe that Milan may not be discounted here. And if we are able to dominate possession, it will be us wearing them down instead. A wink AND a thumb's up...must've been a good play! 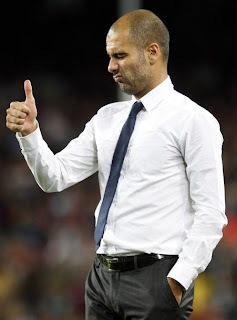 I have long been an admirer of Pep Guardiola. He is dynamic and down to earth, confident and yet humble, but most importantly someone who instills belief and respect in his players. He has won so much so young, and unfortunately for Milan it is all with the blaugrana, a tremendous streak that will be very difficult to break. Still, I also really like Allegri, and he has something to prove, which is often more dangerous than success-driven complacency. His success run may have just begun, but in that sense he is more hungry and winning more important. Milan will need the luck of a good referee. If he is fair, we will certainly be able to take advantage of their diving ways. It’s a shame to see a team with so much talent take the easy way out, but Saturday’s match shows that even the formidable Lionel Messi is not above looking for a gift instead of earning his way. The famous Barca Rainbow Wall... wait, is that a statement of some kind? Speaking of Saturday, we owe a big thank you to Real Sociedad. In addition to coming back from 2 down to serve Barcelona an unsavory draw, they took out former Udinese midfielder Alexis Sanchez, who may be out for up to 2 months now with a hamstring injury, so may also miss the return leg at the San Siro. Not sure if he would have necessarily been a starter, but he is formidable and very familiar with the Italian style of play. I don’t know who Guardiola will field on Tuesday. It’s kind of like taking a woman shopping and telling her she can only have one pair of shoes, he’s got so much talent to draw from. But I do know that he rested some key players on Saturday: Messi, David Villa, and Iniesta came on as subs, while Puyol, Abidal, and Mascherano were left on the bench ad Pique is still doubtful for fitness. One thing is for sure, after giving up a 2-0 lead and 2 points like that to a team that finished 15th last year in their first year back in the top division, Milan probably have some giant targets of redemption on our heads. As for Allegri, he is always difficult to read. Seedorf, Zambrotta, and Robinho were held back Friday as a precaution due to mending injuries and should feature, whereas Taiwo is even a possibility, as he is already back in training. Gattuso is, of course, suspended for this one, and you must have been hiding under a log if you don’t know that Pippo and El Shaarawy were controversially left off of Allegri’s CL list for the Group Stages. Other than that, I think Allegri will field his strongest possible lineup for the trip to the Camp Nou. For the record, I oppose the exclusion of Inzaghi from the CL list. It is heresy and no good can come of it. The rumors of Pippo going to Atalanta in January make me want to vomit. So when I say Allegri will field his best possible lineup, there is one huge asterisk. Barcelona, you are on notice. The Champions League history between these two clubs is a long and rich one. The highlight for me being Milan’s 4-0 defeat to Barcelona in 1994 in Athens, which is still the most significant win in the UCL era. In fact, here’s a great article about it from the talented Sam Lewis. UEFA has a lot of stats and detail about the history of Barca vs. Milan if you are interested, including who has played for both teams (like Ibra) and who played in the most recent showdown, the 2005-06 Champions League semi’s, like van Bommel, who played for Barcelona then. In the end, though, this one will be settled on the pitch on Tuesday. A draw in this one would probably feel like a win for Milan, but a win would be that much better. Most people think that losing to Barcelona is respectable. But not champions. Our Serie A Champions will be going to Camp Nou looking for the win. And I will be supporting them, 100%. 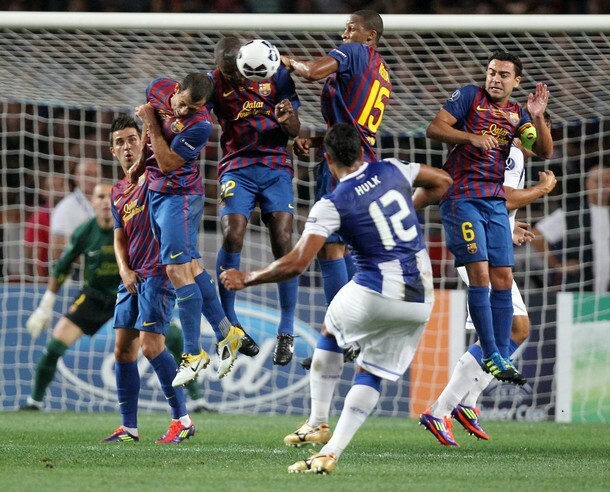 Let’s squash some blaugrana pixies, boys! No one wins forever.